NYC, 04/22/2019, 2:00PM. 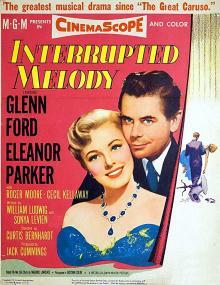 Interrupted Melody (1955): Three Time Oscar Winning Biographical Musical . This movie chronicles Australian-born opera star Marjorie Lawrence's success, her battle with polio, and her eventual career comeback. 106 min. Director: Curtis Bernhardt. Starring Glenn Ford, Eleanor Parker, Roger Moore. Interrupted Melody won the Academy Award for Writing Original Screenplay, and was nominated for Best Actress in a Leading Role and Best Costume Design.